Whether traditional or derived from high technology, ceramics all have the same flaw: they are fragile. Yet this characteristic may soon be a thing of the past: a team of researchers led by the Laboratoire de Synthèse et Fonctionnalisation des Céramiques (CNRS/Saint-Gobain) has recently presented a new ceramic material inspired by mother-of-pearl from the small single-shelled marine mollusk abalone. This material, almost ten times stronger than a conventional ceramic, is the result of an innovative manufacturing process that includes a freezing step. This method appears to be compatible with large-scale industrialization and should not be much more expensive than the techniques already in use. The artificial mother-of-pearl, which retains its properties at temperatures of at least 600°C, could find a wealth of applications in industry and reduce the weight or size of ceramic elements in motors and energy generation devices. This work was published on March 23, 2014 on the website of the journal Nature Materials. Toughness, i.e. 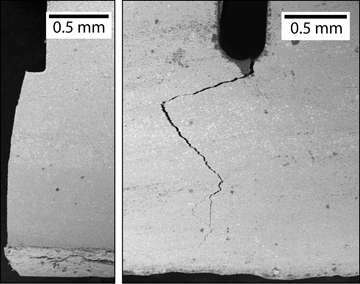 the ability of a material containing a crack to resist fracture, is considered to be the Achilles heel of ceramics. To compensate for their intrinsic fragility, these are sometimes combined with tougher materials such as metals or polymers - generally leading to varying degrees of limitations. For example, polymers cannot resist temperatures above 300°C, which restricts their use in motors or ovens. 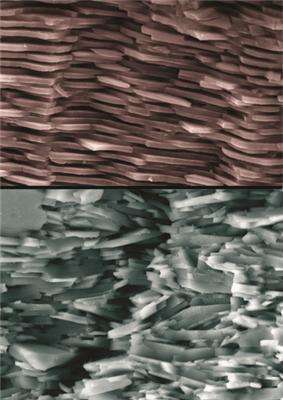 A material similar to ceramic, although extremely tough, is found in nature.. Mother-of-pearl, which covers the shells of abalone and some bivalves, is 95% composed of calcium carbonate (aragonite), an intrinsically fragile material that is nonetheless very tough. Mother-of-pearl can be seen as a stack of small bricks, welded together with mortar composed of proteins. Its toughness is due to its complex, hierarchical structure where cracks must follow a tortuous path to propagate. It is this structure that inspired the researchers. As a base ingredient, the team from the Laboratoire de Synthèse et Fonctionnalisation des Céramiques (CNRS/Saint-Gobain) used a common ceramic powder, alumina, in the form of microscopic platelets. To obtain the layered mother-of-pearl structure, they suspended this powder in water. The colloidal suspension, in which the small size of the particles prevents them from sedimenting under the influence of gravity, was then cooled to obtain controlled ice crystal growth, causing alumina to self-assemble in the form of stacks of platelets. The final material was subsequently obtained from a high temperature densification step. This artificial mother-of-pearl is ten times tougher than a conventional alumina ceramic. This is because a crack has to move round the alumina "bricks" one by one to propagate. This zigzag pathway prevents it from crossing the material easily. One of the advantages of the process is that it is not exclusive to alumina.. Any ceramic powder, as long as it is in the form of platelets, can self-assemble via the same process, which could easily be used on an industrial scale. This bio-inspired material's toughness for equivalent density could make it possible to produce smaller, lighter parts with no significant increase in costs. This invention could become a material of choice for applications subjected to severe constraints in fields ranging from energy to armor plating.